Christopher Nolan really does seem to be swinging for the fences with Interstellar, a very ambitious science fiction tale of human exploration beyond the reaches of our own galaxy. To push the baseball metaphor a little further, let's imagine that he's stepping to the plate with bases loaded, hoping to hit a grand slam and end the game in dramatic fashion. Instead of knocking it out of the park, Nolan ends up bouncing the ball off of the top row, resulting in a ground rule double. Two runners still score, and overall he's done a good job for everyone involved, but it's not the statement victory everybody was hoping for. 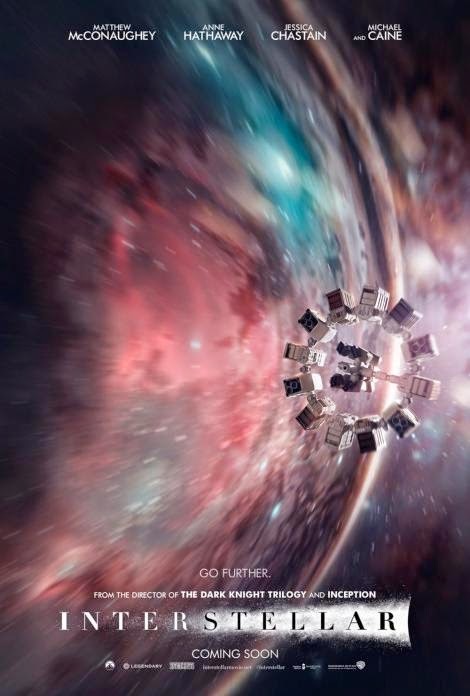 Whether that's a bad thing or not is up to what expectations you bring when you sit down to watch Interstellar. This is going to be a review with SPOILERS because that can't be helped. Nolan's mostly cryptic trailers tell you very little about what transpires during Interstellar, and while I enjoyed the film overall, two of my biggest problems with the film happen during the third act, and neither of them are addressed at all in the advertising campaign. I would advise you to go in knowing as little as possible, so be aware that past this point I will be discussing Interstellar in its entirety. To quickly cover the basics, Interstellar is the story of Cooper (Matthew McConaughey), a test pilot who crashed or had some sort of incident at one point that prevented him from being an astronaut. Luckily for the engineer, he also had a farm he could work on, where he lives with his father-in-law Donald (John Lithgow) and two children, Tom (Timothée Chalamet) and Murphy (MacKenzie Foy). (For the record, Cooper goes by "Coop" and Murphy by "Murph," because I guess monosyllabic names work better in this family). Mom's out of the picture because we're in the near future, where dust storms have wiped out all but the most rudimentary technology and almost all plants are dead. Coop's farm is growing corn, one of the last holdouts from the new dustbowl (Okra goes early into the movie, which from where I'm sitting is no big problem). There's not a lot of discussion in the film about how this happens, and Interstellar is strictly middle-America and space, so don't ask about what densely populated cities are doing. Nolan and his brother Jonathan keep the script focused specifically on the Earth being unsustainable, but since we've abandoned wasting money on space exploration, what can we do? Nolan does a pretty good job of setting up the world of the future without showing too much: the beginning of the film is presented like a PBS documentary, with lots of "talking head" shots of old timers telling us what it was like when things changed. At least one of them was way more famous than I'd expected to appear at the beginning of the movie, but it turned out she was a sneaky third version of a character we'd be meeting later. They cover all sorts of things you wouldn't think of but would probably be doing if there was an inch of dust over everything all of the time, like put your dishes out on the table upside down (maybe there are no cabinets in the Midwest?). It gets the job done pretty well. It's a sparse world that Coop and company live in - other than lots and lots of corn, you don't really see anybody. There are no animals in the film at all, and the town he lives near seems pretty deserted early in the movie. I can't remember seeing any other students at Tom and Murph's school; only the principal and Murph's teacher, who asks Coop to tell her the Moon landing was a hoax (the Room 237'ers win in the future and textbooks are rewritten to talk us out of believing space exploration existed). The only crowd you ever really see is at a baseball game (see what I did there? hint: first paragraph), where John Lithgow complains that popcorn isn't something you should have at a baseball game. He wants hot dogs. Well guess what, corn farmer, you should be grateful people are buying your product - you know, the only available one. The players are wearing Yankees hats, but I don't know if they're supposed to be that Yankees or just some local guys. It doesn't matter, because the game is interrupted by a huge dust storm. There's not crying in baseball, and also no finishing the game because of dust delays. Coop brings down a drone because he's a mischievous sort, but a strange magnetic incident in the house (Murph calls it her "ghost") leads them to a secret NASA facility where his old mentor, Professor Brand (Michael Caine) is working on humanity's last chance: a ship capable of travelling through a wormhole near Saturn. How or why the wormhole got there is mentioned, but not speculated on, but NASA sent twelve astronauts into another galaxy in the hopes of finding a new home for humans. Three signals (Dr.'s Mann, Edmonds, and Miller) have come back indicating likely candidates, so Brand wants Coop to fly the ship into the wormhole and investigate. The crew of the Endurance also includes Romilly (David Gyasi), Doyle (Wes Bentley), Brand's daughter (Anne Hathaway), and TARS (Bill Irwin), a robot on loan from what's left of the military. One of the first things TARS does during takeoff it to make a joke about shooting Coop out of the airlock, just in case you didn't think Nolan was aware that Interstellar is often reminiscent of Stanley Kubrick's 2001: A Space Odyssey. That, it turns out, is not a bad thing, at least for the first half of Interstellar. Once we get into space, Nolan stretches out a little bit for some big time spectacle filmmaking, and if you thought you needed to see Gravity on a big screen, Interstellar demands the largest one you can find. Also, one with comfortable chairs, because with the trailers and ads and everything else, you're looking at a three hour minimum investment. But for a lot of the movie, it's worth it. We've seen the vastness of space before, but Nolan's choice to keep the camera attached to the ship most of the time (like we see it in actual NASA footage*) adds a verisimilitude to the proceedings that helps sell the science fiction elements. McConaughey's folksy twang and a more dialed-back than usual Anne Hathaway also help in that regard. They're scientists, but they aren't science types, if that makes sense. They understand the consequences of their actions and have to weigh the adverse effects of their decisions while soaking in the fact they're in another galaxy. If I'm being honest, I would have liked more of the exploring the other planets instead of the part of Interstellar that you don't necessarily get from the trailers: the back and forth between Coop in space and his family on Earth. Instead of focusing on relativity and black holes, we have to keep jumping back home to see that Murph stills hasn't forgiven her father and now she's grown up and is Jessica Chastain (Tom is now Casey Affleck disguised as Ben Affleck in Argo). Murph is working with Professor Brand on how to save everybody on Earth because they haven't heard from the ship in 23-ish years (2 years to Saturn plus another 21 thanks to a disastrous turn of events on the first world they land on). It's here that the Nolan brothers introduce the theme of Interstellar that isn't about exploration: that love may be a tangible concept that transcends dimensions and we just don't understand it yet. Oddly enough, the internet's least favorite person (Anne Hathaway) delivers the best monologue about it, but it leads Interstellar down a path I maybe could have done without. The space exploration was so much more interesting, and the Earth plot isn't. Since we've moved to the "gripe" stage, it would be nice, just once, for writers to drop the well worn science fiction trope of "scientist from the previous mission goes insane and nearly ruins the mission." It nearly derailed Sunshine, an otherwise sober, intelligent movie that drastically shifts into a slasher film near the very end, complete with its own Freddy Krueger. The Nolans don't do anything quite so drastic, but it's clear from the moment that Dr. Mann (Matt Damon) wakes up from cryo-sleep that he's not selling Coop, Brand, or Romilly an honest bill of goods about his planet or his agenda. Not only is it predictable what he's eventually going to do, but the "turn" is almost comical as he leads Coop out to the middle of nowhere for a fistfight. Instead of, oh, I don't know, appealing to the team that losing one of the four remaining scientists tasked with keeping the human race alive is detrimental to all of them. This works to a certain lack of logic that is, I must admit, typically when you think carefully about Christopher Nolan films, from the Batman series to Inception, or even back to Memento. After an impassioned speech by Brand about why they should fly to Edmonds' planet instead of Mann's (they only have enough fuel to pursue one of the remaining leads), Cooper and Romilly reasonably determine that Mann's reports are better than Edmonds'. If we were to approach the same reasoning to Cooper's decision to go back to Earth on the off chance that he can disprove the "Plan A can never work" argument that conveniently surfaces right after they've revived Mann, there's no way the other three would allow him to go back through the wormhole. Ignoring the convenient timing of Murph's message, we already know that there's no guarantee of when Cooper would be returning to Earth, or even if there's enough time to come up with a plan to save humanity. This brings us to the second part of Interstellar that I can't quite give a pass to: after Mann tries to steal the ship and blows up part of it when he tries to open the airlock without docking, Cooper pulls off a near impossible feat of docking while the wheel is spinning (think of a sped-up version of 2001) and decides to send Brand to Edmond's planet using the black hole's gravitation to slingshot her (remember, not enough fuel). This means that Cooper and TARS have to pilot the other two shuttles and sacrifice themselves by being sucked into the black hole, where we've been continually told is a singularity they really would love to know more about. Invariably, Coop is sucked into the singularity and finds himself outside of the ship, floating in a strange, multidimensional space. Upon further investigation, he realizes he's behind the shelf in Murph's bedroom, and that (wait for it) he can slightly effect physical space around her throughout her timeline. Yes, Coop is his daughter's "ghost," and if he can communicate with her, he'll be able to save humanity where Professor Brand failed. I wouldn't have so much of a problem with this part of Interstellar were it not for the point when TARS chimes in over the radio and Coop begins explaining what's happening and what he's going to do. Like, out loud, literally explaining to the audience exactly what they're seeing, it's implications, and how he can communicate with grown up Murph (through a watch he left behind, using Morse Code). Nolan takes all of the ambiguity out of the sequence, and flat out tells us (through Coop) that humans evolve to the point where we can see beyond all dimensions and create the wormhole to save ourselves. I'm not spoiling anything because that's what McConaughey says, almost verbatim. At the outset of the "ghost" section, I really thought "he's not going in this direction, is he?" but by the end, when even the cheap seats are being spoon fed the plot, it was almost too much. And had Interstellar not regained some of its footing at the very end, when Nolan successfully pulls at the heartstrings (at least for the Grinch-like Cap'n), there's a strong possibility I would have come out hating this movie. The emotional manipulation is transparent at the end, and I'm not going to pretend it isn't, but Nolan finds a way to make Cooper meeting the old version of Murphy (Ellen Burstyn, who I did not recognize at all**) poignant enough that I could overlook the Saturn space station that looked like Elysium, dumb baseball callback, and implausible ending where Coop steals a spaceship to go find Brand. Looking back on it, I'm not sure why I'm okay with that, because when you apply logic to it, that's a really stupid way to end a movie that tries hard not to be dumb, scientifically. But that's how Christopher Nolan films are, I guess: they're fun to watch, offer astounding visual spectacle, and make about as much sense as Bazooka Joe gum in retrospect. The acting is solid all around, and if you're one of those people who inexplicably hate Anne Hathaway, this is not going to be on your "Exhibit A" YouTube videos. On the other hand, if you aren't down with the McConaughnissance, you'll find plenty of "all right, all right, all right" in his sometimes mumbled dialogue. I thought he was fine, but something about his drawl is always going to invite the "he's just stoned" reaction, and this won't change that. Jessica Chastain has a lot of screen time in the second half, but Murph is such a cipher of a character that she doesn't have anything to work with. Casey Affleck gets even less, and he registers about as much as Wes Bentley, who has half as much screen time and dies (hey, I said SPOILERS a long time ago). Nolan sneaks in a bunch of well known actors in small roles, well beyond the "oh, I forgot Matt Damon was in this! ": David Oyelowo (Rise of the Planet of the Apes) is Murph's principal, William Devane (Payback) is a member of NASA, and for no discernible reason, Topher Grace (Predators) just appears as Murph's friend late in the film. I guess he's the doctor that she mentions can look at Tom's kids (dust clouds, as it turns out, are bad on the lungs), but he's just suddenly there, and you think, "wait, is that Topher Grace?" Yep, it is. He's in Interstellar. Who knew? This isn't really a negative review, but I guess it's not quite positive, either. In his filmography, I'm inclined to put Interstellar somewhere in the middle, above Insomnia but not quite near Memento. Visually, I wouldn't hesitate to recommend it, but if you have persistent issues with Nolan (as much of the internet and some of the critical community do), this isn't going to win you over. All of his highs and lows are on display, and it depends on how you weigh them whether that's enough to make Interstellar worth three hours of your time. It falls short of 2001, the film it's trying to come closest to, but I give Nolan a lot of credit for trying to make a movie about ideas, even if some of them are hoary or clumsily handled. This is mass audience entertainment that isn't just going to the lowest common denominator (*coughrobotdinosaurscough*), so that counts for something. At this point in his career, I imagine most of you know where you fall in the Christopher Nolan spectrum. Through no clear action of his own, he's become a very divisive filmmaker, in part because in a world of increasingly skimpy Hollywood output, he's afforded carte blanche as a filmmaker and every new movie he makes is treated like an event. This seems to magnify both the positives and negatives inherent in his style of filmmaking, and reactions are equal parts "that was great!" and "the emperor has no clothes!" which enter the echo chamber of the internet and are magnified. I don't know that I would have devoted this much time to a review that was this mixed if there wasn't something to Interstellar worth talking about, good or bad. Believe me, there are films I could have reviewed that you'd probably be very surprised to hear I wasn't crazy about (Boyhood, Gone Girl), but that I'm just not sure I have much to add to the discussion. With this film, at least Nolan gave me something to talk about. Interstellar isn't the best science fiction film I've seen this year, but 2014 has been a surprisingly fertile year for great science fiction. I'm going to go out on a limb and say you should probably see this over Ouija, but I haven't seen Ouija so I could be totally wrong. No, wait, I couldn't. For all of it's faults, there's no way that Interstellar is not way better than Ouija. Cheap shot at Ouija? Easy target? Probably, but I don't know if Interstellar holds its own against something like Snowpiercer, but it was made with a different size audience in mind***. It may not win the game in a grandiose fashion, but Christopher Nolan delivers another solid, mostly impressive film. For some people, that's not going to be enough, but for most it's better by a long shot than most of what passes for "crowd pleasing" movies. ** All the more confusing, because you can totally tell it's Ellen Burstyn in the "documentary" footage at the beginning. You just don't know she's Murph at that point. *** Or not, but I guess we'll never know since the Weinstein's sat on Snowpiercer after trying to cut it to pieces, and then half-heartedly dropped it in a few theatres.